Technology is moving so fast. As a result, the frequency of changing phones is becoming high. It is easy to switch to a new phone. 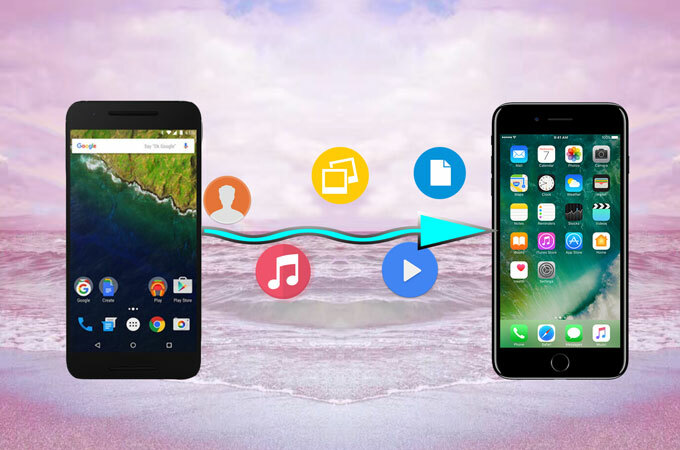 However, it is not easy to transfer files between phones, especially between Android and iPhone, as they adopt different operating systems. Apple released its iPhone 7 and iPhone 7 Plus, which are fantastic and charming. Some Android users might have already bought the new iPhone and wonder how to send files from Android to iPhone. Now we recommend two great applications to solve this problem. Read this article and figure out what they are! ApowerTrans is designed to help both Android and iOS devices owners to get data from one phone onto another without using computer as a medium anymore. The concise display looks clear for users, so that they could easily master data transmission. 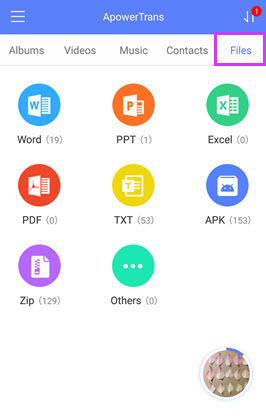 The types of files that the app could transfer include photos, videos, music, contacts, etc. What’s more, the connection between phones can be established with and without the network. Follow the instructions below and start to send files from Android to iPhone. Firstly, download the application on both phones. Secondly, set the phones in the same Wi-Fi. Open the app on the phones and tap the button on the lower right corner. It will directly go to Radar interface. Thirdly, on one phone, click the avatar to build the connection. You can transfer photos to iPhone through this phone transfer tool, whether you want a single photo or photos in bulk. Tap “Albums” on your Android. If you want to transfer an image to iPhone, go to a certain folder, check the picture and click “Send”. If you want to add several photos, select the photos under the folders, and click “Send”. To transfer a folder of pictures, tap “Select All” and “Send”. After the steps above, you can get the images on your iPhone. Go to “Videos” tab on the Android phone. Choose the videos you need and hit “Send”. Also you could use “Select All” to transfer all videos. Unlike photos, which are stored according to different locations, videos are just displayed under the “Videos” tab. If you save too many videos on your phone, you can slide down on the interface, search for a certain video and check it. And then, tap back button of the phone or “Cancel” to go back to the “Videos”. Most people love music and develop the habit of listening to the music on the go. Therefore, music is usually written down on the “Must Transfer” list. 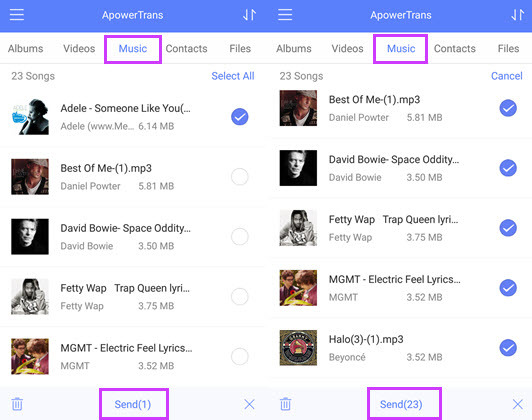 With ApowerTrans, you can continue to enjoy songs that were stored in Android on your iPhone without downloading them again. Select the songs by tapping the checkbox beside or “Select All” button. Contacts are rather essential, because they are related to our daily social communication. Thus, contacts must be at the top of “Must Transfer” list. 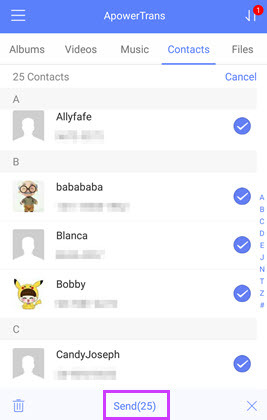 Will it be complicated to transfer contacts to iPhone? Definitely not! Tap “Contacts” on the app. Select the contacts and press “Send” to start transferring. “Files” function consists of documents, zip and other kinds of files. Hence, under this tab, you can go to each type of documents and transfer data from Android to iPhone. SHAREit is an app that could also help you move data among phones wirelessly. It is compatible with Android, iOS and Windows devices. Better yet, it transfers files fast and doesn’t need mobile data. You could utilize it to transfer videos, apps, photos, music and more between phones. 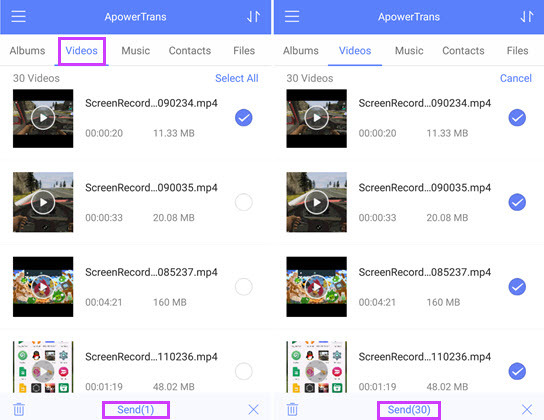 Take “Videos” as an example, we will show you how to transfer videos from Android to iPhone. Install and open the app on Android and iPhone. On Android phone, the videos are categorized in different folders. So, tap “Send” and then go to “Videos”. Choose the videos and press “Send” again. On iPhone, hit “Receive”. And on Android, tap avatar of iPhone to make the connection and activate the transmission. When the process completes, you can enjoy videos on iPhone. And you can use the same method to transfer Android data to iPhone. Both apps enable you to copy phone data to another mobile. 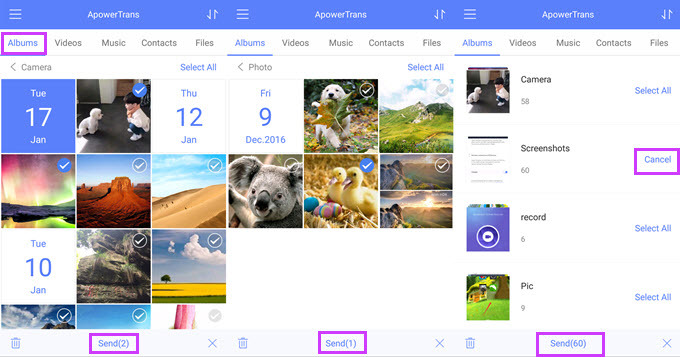 ApowerTrans has a clean interface on both Android and iPhone, so users could easily know what they should do or where they could find certain files. SHAREit is well known for its transfer speed and no limitation to the size of files transferred, but as to the app interface, it has too many ads and is a little bit complicated for new users to transfer files. Also, the interfaces on Android and iOS devices have some differences, which may cause you to waste some time figuring out how to send files from Android to iPhone and vice versa.